This is the last week and a half for you to be able to take advantage of the early release bundles of the Share What You Love Suite. You will still be able to buy all these products when the new catalogue is released June 1, but you will not be able to earn the free gifts provided with each of the three bundles. 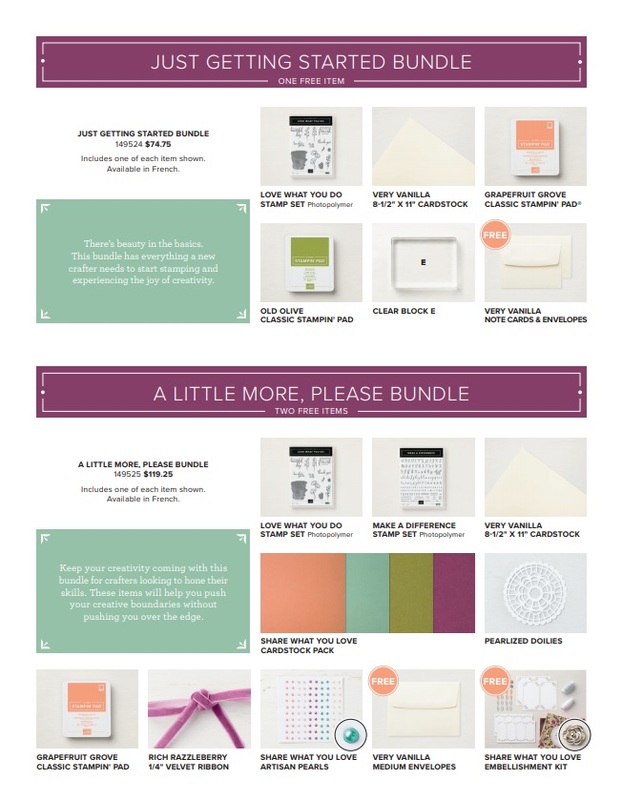 And the Just Getting Started bundle and the A Little More Please bundle are both in low inventory, meaning they could sell out soon, so it would be a good idea to get your orders for those in ASAP. I'll show the flyers at the end of this blog post for your information along with how to order. In the meantime, I want to show you another sample I made for our last Technique Night class where we focussed on this Share What You Love suite. You can find the other two cards we worked on here and here. This card uses two of the Share What You Love Specialty Designer Series Paper designs with a Rich Razzleberry and Crumb Cake palette. The two pieces of Share What You Love Specialty DSP overlap slightly on the card and are embellished with a 7" piece of the Rich Razzleberry Velvet Ribbon tied with a piece of the Nature's Twine* in Blackberry Bliss, one of the new colours in our colour revamp. 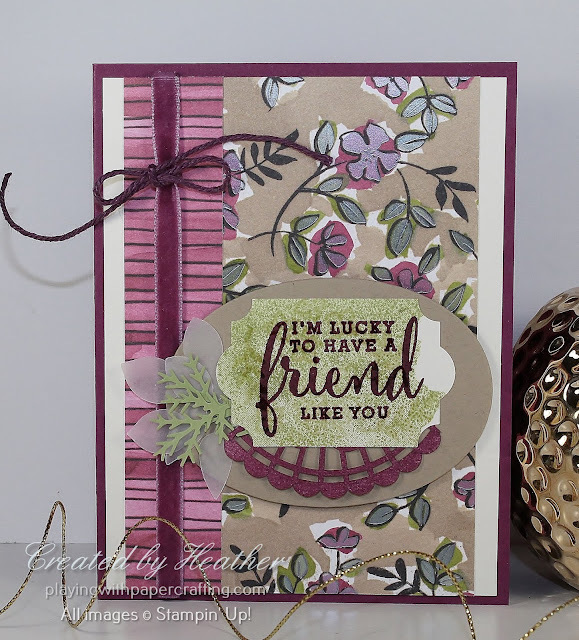 Using the watercolour background stamp from the Love What You Do stamp set as an Old Olive background, the sentiment from the same set was stamped in Rich Razzleberry over top. 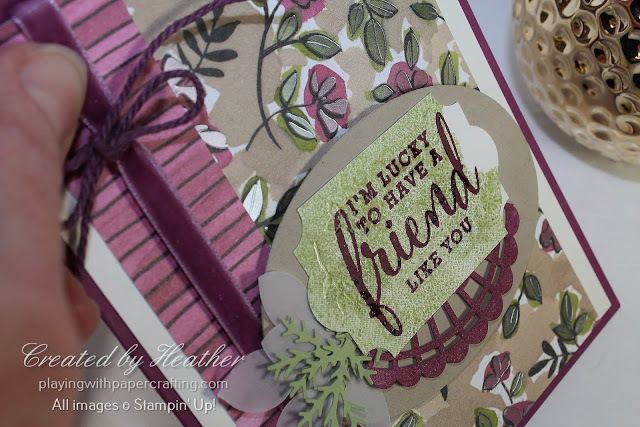 I did stamp off the background stamp once before stampin' it on the cardstock. 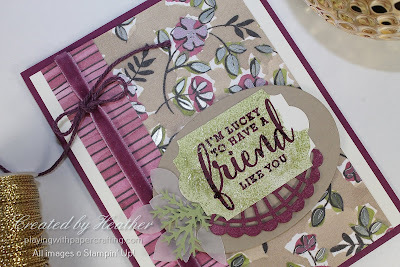 It's a little hard to see here, but I took the small bunch of flowers and the leaf sprig stamps, and stamped them in Versamark over top of this sentiment, covered them with Clear Stampin' Emboss Powder and heat set them with the Heat Tool. It just provides a little extra subtle interest. Then I punched out the shape with the Everyday Label Punch. 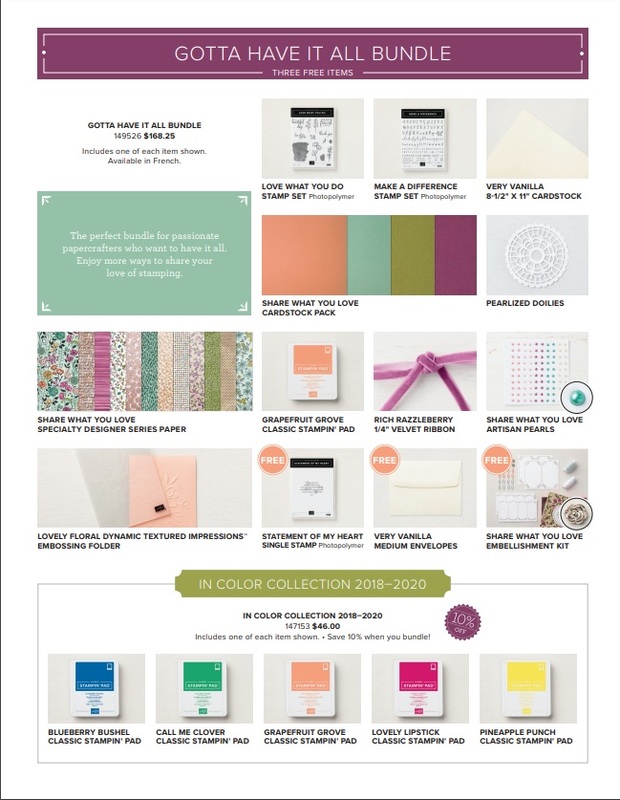 *New products from the 2018/19 Stampin' Up! Annual Catalogue available to purchase starting June 1, 2018. On the back of this label, using adhesive and Glue Dots, I attached a piece of leftover Pearlized Doily that I had turned over to the flat-finished side and brayered with Rich Razzleberry ink, trimming it to fit properly. It was actually the doily piece that I had left over from this project. I used the Sponge Brayers to do the brayering. I love what a great job they do. I also attached a couple of vellum leaves punched out with the Leaf Punch, and another couple of leaves punched out of Old Olive cardstock using an old Martha Steward Leaf Punch that I have. 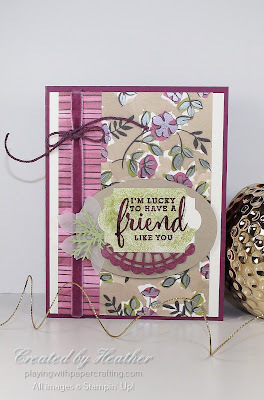 This whole ensemble was glued to a Crumb Cake oval, die cut with the Layering Ovals Framelits and that again was popped up on Stampin' Dimensionals to the card front. To order, click on my On-Line Store, and go to Share What You Love Suite and choose the bundle you want, enter it in your shopping cart and check out as a guest or open an account. It will be shipped right to your door. Or contact me and I will place an order for you.